Then, on Saturday night, when we had our girls’ night out, some internal instinct told me not to drink anything with alcohol in it. I felt tired, headache-y, and run-down, and I knew that drinking would make me feel a lot worse, so I didn’t. Not a big deal, I figured I was just tired. This virus has now taken out both me and Lucy. (And let me tell you, taking care of a sick baby when you feel like death yourself? Not fun.) We’re both coughing and congested. Lucy decided to throw in some fever and diarrhea just for good measure, which was enough to get me to haul her off to the pediatrician’s office. She’s trying her best to still be a sweet and happy baby in spite of it all. “Miserable” is not this child’s baseline personality, to say the least. 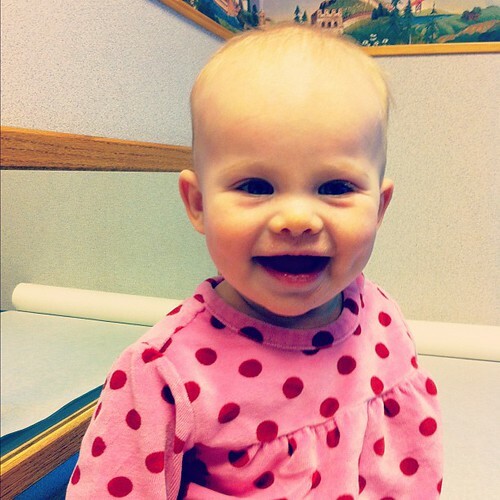 Lucy was deemed fine – no ear infection (my main concern), just a really nasty virus. Today, my dad woke up sick. And my mom said she feels like she’s coming down with something, too. And so it continues. 2012 is not getting off to the best start. I know it’s just winter and the stupid dry air in the furnace and the germs at daycare and all of that. But I will be really happy when The Plague has left our house. Until then, I need to go buy some more DayQuil. I’m chugging that stuff like there’s no tomorrow. This entry was posted in Lucy, Whining and tagged cold season, daycare, germs, kids, Lucy, virus by Cindy. Bookmark the permalink. Poor you and baby! I miss you bunches. Hope you are both better soon!! Man, I hope you guys get a well deserved break soon. You poor thing(s)! Being sick and having a sick kid is NO fun at all. I hope you all feel better very soon!